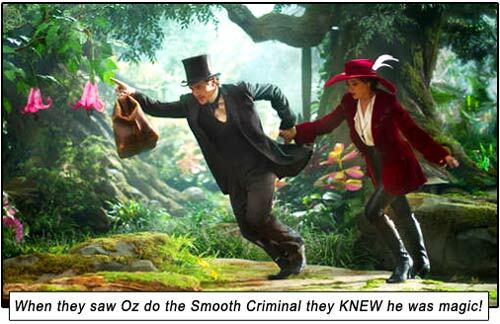 An origin tale of how a sideshow charlatan becomes the Wizard of Oz, OZ THE GREAT AND POWERFUL is as wondrous and exciting as the film that inspired it, which means it is kaleidoscopically trippy and makes no sense. In 1905 sepia-toned Kansas, James Franco is carnival magician Oscar Diggs, a womanizing narcissist, swept away in a tornado to a bombastic Technicolor land where animals talk, magic exists and women are (still) witches. He uses his duplicity and illusionist sleight of hand to dupe the populace into thinking he is the great Wizard spoken of in legends, and is emplaced in the Emerald Palace just before Judy Garland arrives with all the good drugs. First there was the vaudeville B-Movie that became a legend in 1939, THE WIZARD OF OZ; the blaxploitation remake THE WIZ in 1978; the dark, largely-overlooked RETURN TO OZ in 1985 (which would be appreciated more readily in these DARK KNIGHT times); and now, adhering to the fad of the age, OZ THE GREAT AND POWERFUL is a prequel exploring how the Wizard became The Man Behind The Curtain. An intriguing concept, the visually gluttonous GREAT AND POWERFUL could have been darker, but unfortunately ends up drowning in Disney syrup (except for the fearsome flying baboons, which I suspect caused as much sleep trauma for today’s kids as the now puppet-looking flying monkeys caused for 1939’s kids). Its pedigree will give it more impetus than it deserves, umbilically linked as it is with 1939’s WIZARD. Not to say that WIZARD was a daring film – a product of its times, only achieving classic status for the fact that parents keep administering it to their children as readily as Ritalin, lending it more credibility than the half-baked LSD trip that it really is. When Oscar lands in Oz, he meets three women (Mila Kunis, Rachel Weisz and Michelle Williams), all of whom seem morally ambiguous; no matter how tasty each of them looks, they all have some ulterior agenda and at the slightest prompting are apt to suddenly turn into evil witches – in other words, they’re your average woman. One of the witches (claiming to be “good”) sends Oscar on a quest to destroy the “evil” witch in order to claim his castle of gold. On his quest along the yellow brick road, Oscar is aided by a monkey called Monkey (Zach Braff) and a cute little china girl that he calls Little China Girl. (She seems like Jena Malone, but she is voiced by Joey King.) They all, in turn, call him Wizard. An endearing moment when Oscar tells the china girl of “a real wizard – Thomas Alva Edison – the Wizard of Menlo Park.” A very cool real world credit in this fantasy film. Directed by Sam Raimi (of the SPIDER-MAN trilogy, which means that Bruce Campbell will somehow make a cameo – he does, as an Emerald City Guard), GREAT AND POWERFUL looks striking, and will amuse the same demographic that the original film was aimed at (i.e. very young hyperactive kids on Ritalin). And James Franco is the perfect foil for this land where duplicity reigns over naïveté, able to pull off that innocent smile to sell his snake-oil, yet having the braggadocio to counter the witches. It’s a great angle – that of an illusionist tricking his way into the post of Wizard; that is, after all, what the actual “wizard” turns out to be in WIZARD OF OZ – a charlatan. And strangely, it is through his mendacity that Oscar finds redemption, as the very same trickery he used to charm people into believing he was a Wizard is employed to defeat the evil witches. But there’s a conceptual problem: when you bring REAL MAGIC into the mix, it skews everything, including good storytelling, because the boundaries of Real Magic are never delineated. For example, when the baboon grabs the good witch, she has her wand with her – a wand that can conjure tornadoes of fire and liquid nitrogen and laser blasts – yet the baboon grabs her anyway. Was the wand battery low or something? And why is china girl so amazed at Edison creating “pictures that move” when she lives in a world where witches can fly in bubbles and shoot lethal energy bolts from their hands? And she’s a porcelain doll that lives and breathes, against all biological laws! Gimme some rules, people! And the greatest conundrum of all: how could the evil witches possibly be fooled by Oscar’s trickery? Playing devil’s advocate, I guess that in a world of REAL magic, you would not be expecting, nor would you even conceive of, someone bringing ILLUSION into the fray. So when Oscar projects his face onto the town square in a pillar of smoke, these witches would be inclined to believe that he must be using magic, because in their minds there is no other option. Still, I’m sure the 5 – 15 demo is not rationalizing this scenario. Writers: David Lindsay-Abaire, Mitchell Kapner, L. Frank Baum. Starring: James Franco, Mila Kunis, Rachel Weisz, Michelle Williams, Zach Braff, Bill Cobbs, Joey King, Tony Cox, Stephen R. Hart, Abigail Spencer, Bruce Campbell, Ted Raimi.